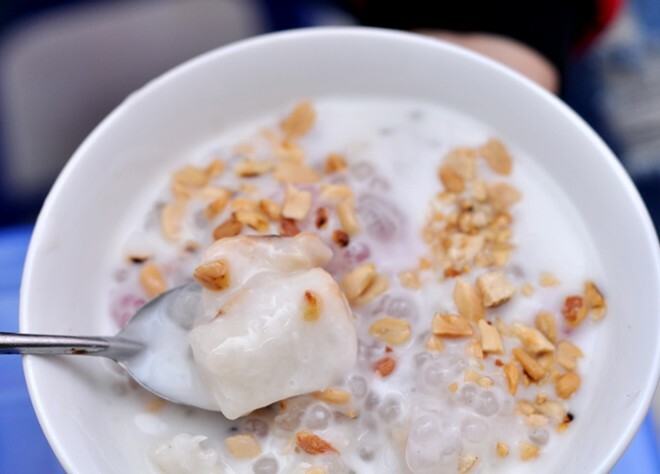 Che chuoi is a mouthwatering daily sweet dessert made from a kind of flavorful banana called chuoi xiem cooked in coconut milk with sago pearls. Looking like pudding, che chuoi has a sweet and creamy flavor and a delicate banana scent. To counterbalance the creamy flavor of che chuoi and add a splash of color to the dessert, a little bit of roasted peanut topping is sprinkled on this sweet soup. Address: Nguyen Dinh Chieu Street, District 3, Ho Chi Minh City. It will cost you VND 10,000 for each bowl of Banana with Sago Pearls and Coconut Milk Sweet Soup. 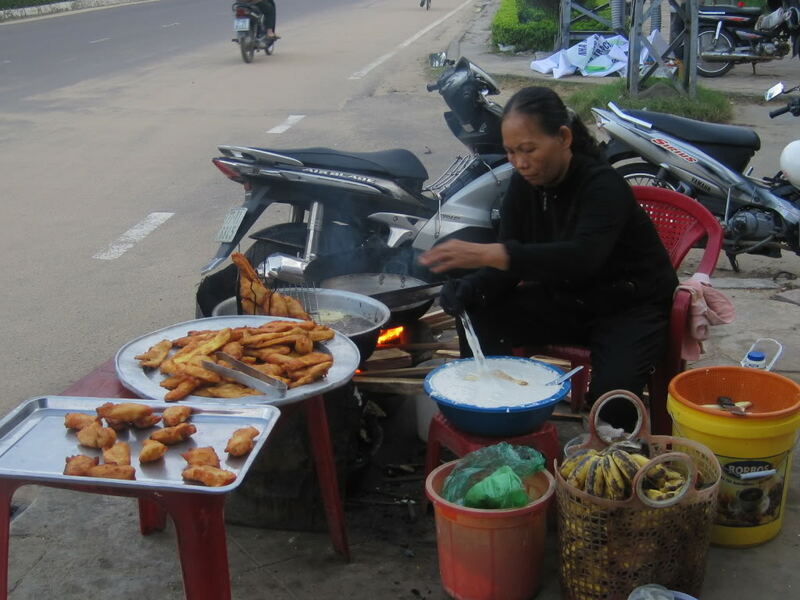 Fried banana is a Saigon street snack that is hard to miss. One taste instantly takes you back to these good old days of childhood when things were simple, there were not too many snacks to enjoy, these days when just a few fried bananas on a rainy day could put a big smile on your face. Crunchy outside but soft and warm inside – all elements perfectly complement each other. 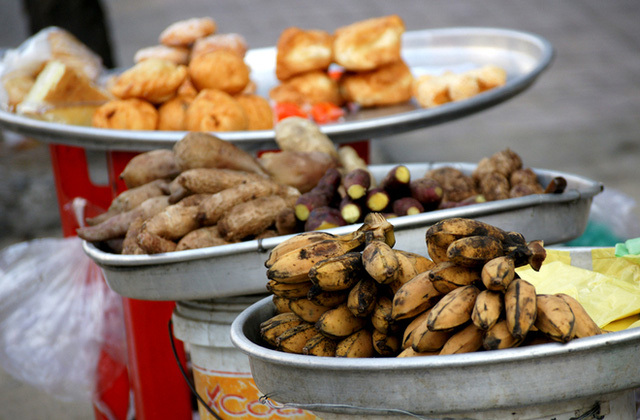 Fried banana is often made from a special variety of small, stubby bananas called chuoi xiem or chuoi su in Vietnam, which are much sweeter and more fragrant than normal bananas. To get the most heavenly crunchy outer crust, the secret is to double deep-fry. Once the banana fritter begins to brown, they take it out and immediately dip it back in the batter, and then put it in oil one more time. To maintain the crispness, enjoy the dish when it is still hot. Where to find the best chuoi chien in Saigon? Chuoi Chien Gion, No 100/27 Tran Hung Dao, Pham Ngu Lao Ward, District 1. Banh Cay Chuoi Chien, No 81 Tran Quoc Thao, District 3. Chuoi Chien – De Tham, No 40 De Tham, Cau Ong Lanh Ward, District 1. Grilled Banana wrapped in Sticky Rice is a popular street food in South Vietnam in general and in Saigon in particular. Covered by steamed sticky rice, wrapped by banana leaves, the banana is then cooked on charcoal grill. The banana dish is a perfect mix of the smell of coconut milk and the sweetness of banana. What make this dish a favorite choice of many people? It should be the fragrant sweetness of ripe bananas mixed with fleshy fat of coconut and sticky rice and the characteristic aroma of banana leaves. Chuoi nuong is best enjoyed when it is still hot. Pour spoons of coconut milk and sprinkle crushed roasted peanuts on grilled banana, and let’s enjoy! For a rainy day, what is much better than this dish? 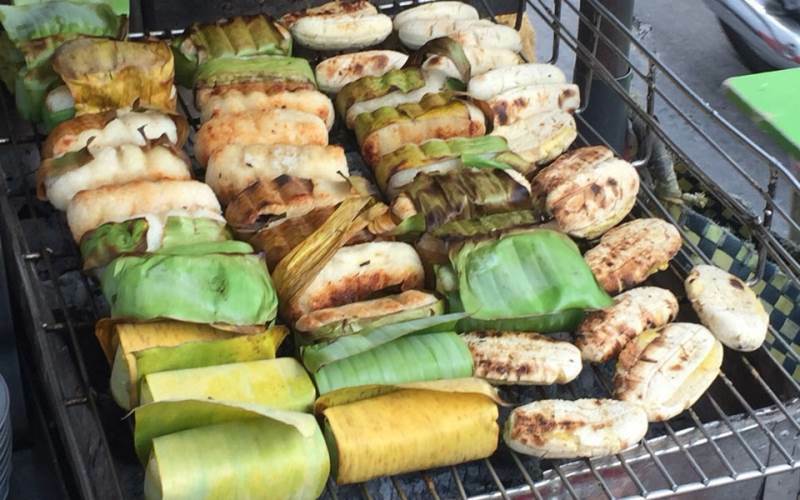 Where to go for Grilled Banana wrapped in Sticky Rice? This dish is often sold on the sidewalk of Nguyen Van Thu Street (District 1), Hien Thanh Street (District 10), Le Van Sy (District 3), Vo Van Ngan (Thu Germany), Dien Bien Phu (Binh Thanh District), etc. Grilled banana slices are usually sold near offices, on sidewalks, at the front gate of the school. They make grilled bananas in advance and put them in a plastic bag. The type of banana chosen to make this dish is chuoi sim. Not too ripe, not unripe, only banana, which is ripe enough, is chosen. They cut these bananas into thin slices so that when being baked, it is crunchy outside and sticky inside. Bite a crispy grilled banana slices then you can immediately feel the sweetness melting on your tongue. Where to go for grilled banana slices?